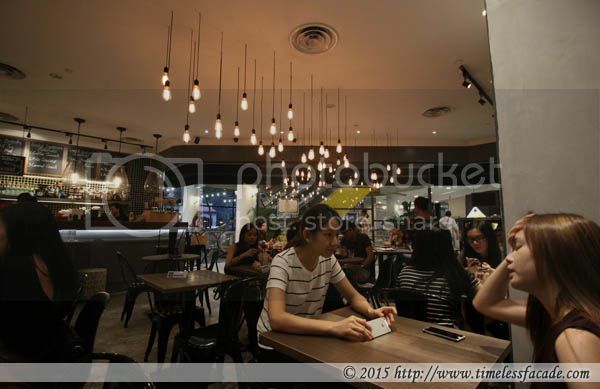 Real Food Reviews: Benjamin Browns Bistro & Bakery - What's All The Fuss About? Met up with some friends for dinner at Benjamin Browns for dinner one weekday evening after seeing how over the top shakes seem to be the rage nowadays. Benjamin Browns, or BB for short, sits on the first floor of the relatively quiet Forum The Shopping Mall and by virtue of an earlier reservation, we managed to snag a corner table. Seating is rather limited (probably ~ 20-30 pax) and there was a queue to get in after we were done with dinner. This wasn't my first choice but since they were apparently out of their "Benjamin Burger", I had to make do with this. 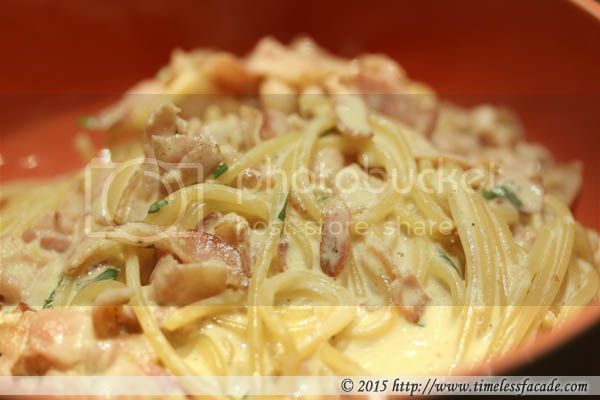 And it wasn't a great choice; less than al dente pasta coupled with creamy but a tad watery base. Only consolation was the generous serving of bacon slices. Nothing like La Strada's. 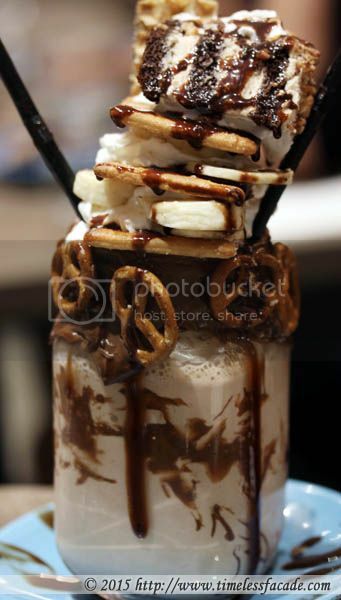 And the primary reason behind our choice to dine at BB, their over the top milkshakes. Honestly it was no great shakes (pun intended) and definitely didn't look as pretty in real life as in those instagram photos (presentation came across as a little slip shod). It was essentially diluted banana milkshake topped with layer upon layer (3 to be exact) of sliced bananas, whipped cream and sugar crackers (which looked and tasted suspiciously like they were from Khong Guan), finished off with a brownie as the crowning glory and a chocolate wafer wedged by the side. Pretzels adorned the side of the glass, held together by a layer of gooey nutella. Overall this was a giant sugar rush and too much of it made me a little sick. Lesson learnt - share it, hence the 2 straws provided. 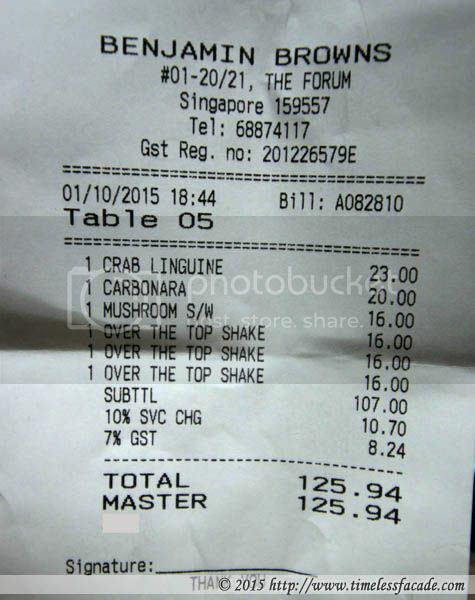 Definitely not worth the $16++ though. My share came up to about $42 which wasn't quite worth the money in my humble opinion. Food was average at best and even the much vaunted shake fell flat. Service was also found wanting. One of the wait staff was obviously unsure about the menu and had to repeatedly come back to us about the food we ordered. Conclusion? Yet another run of the mill place hyped up and glorified by social media.